The audioguide tells the story, describes the architecture and presents interesting facts about the basilica of the Saints Felice and Fortunato, a paleo-Christian monument of history that is rooted in the ancient history of the Roman Empire. Much evidence of the Roman presence was found in the territory of the church, during various excavations. Some of these finds are kept in the Civic Museum of Vicenza and the other in the Basilica Museum. Among the most significant finds are the Petronio Stele with an inscription and unbisselion (two-person seat) and a priestly and masterly scroll. Another curious find is the sacred altar of Venus, found in the masonry of the martyrion of the basilica. The church is dedicated to the brothers Felice and Fortunato, the vicentini martyrs, decapitated in Aquileia, in the times of Diocletian's persecution. One of the oldest and most important basilica sites is the Martyrion. At the bottom of the right nave is the entrance to this chapel dedicated to Sancta Maria Mater Domini. It was built in memory and in honor of the Saints Felice and Fortunato, but there are also relics of other saints. Only some fragments of mosaic have been preserved, mainly in the northwestern part of the church. In them there is the symbolism of the images and the spiritual grain that characterizes the mosaics of the grandiose Paleochristian basilicas. The best preserved mosaic composition is that of the winged lion, a symbol of the evangelist Marco. On the north side, there is the representation of a saint on a golden background. The grandiose representation of the sky vault, in the dome, presents the same iconography. 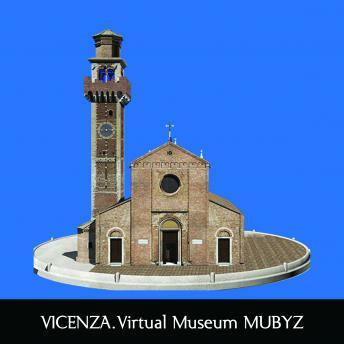 You can examine the 3D model of the church and observe its interior through the MuByz App. The audioguide has been made by professionals in the field of history and art.